I just wanted to write a quick note to say thanks to everyone who has left a note or sent a supportive email. It is very much appreciated. If you have no idea what I'm talking about, my wife's grandfather passed away. He was the last living grandparent for either of us. He lived a great life and made it all the way to the age of 93. Even more, he remained healthy and sharp for all but about the last 6 months of his life. We should all do so well. While there were some sad moments, the service was very much a celebration of his life and a good time of fellowship with family members that we don't get to see as often as we would like. The trips to and from the Panhandle, however, proved to be rather challenging. The trip up was to Amarillo was difficult from the get go as it poured on us for about the first 4 hours of our trip. Throw in a handful of accidents on I-35 and it was quite an ordeal. We even ran into some light sleet near Vernon, Texas. A trip that normally takes 8 hours suddenly turned into 10. My oldest daughter and I had to turn around and return after only two nights. She had tests to prepare for and my basketball team had a game the next night. We left Amarillo about 2:00 in the afternoon on Monday and quickly ran into trouble. The wind was absolutely screaming as a cold front had blown through the Panhandle the night before. All kinds of wind warnings were out and straight-line winds of 60 mph were almost constant. It wasn’t long before the dirt from the bare cotton fields in the area was sucked up and blowing all over. We hit a couple of spots on highway 287 where, just for a few seconds, visibility was absolutely zero due to the dust blowing. It seemed to clear up a bit briefly but things changed just before we arrived in the small town of Memphis. It was at this point that we found ourselves smack in the middle of a full-fledged sand/dust storm. It was like something out of the movies. Very scary. Visibility was so bad I could not see more than 5-10 feet in front of the truck. I wrestled with myself over whether or not I should pull over but decided to keep moving, albeit extremely slowly. The storm seemed to ease a bit as we rolled into Memphis but there waiting for us was a road block. The Texas Department of Transportation had completely shut down highway 287 between Memphis and Childress. The person I spoke to said that visibility was down to 0 and there had already been a multi-car accident just ahead. The delay cost us well over an hour. Eventually, we did get going although we were forced to take an alternate route. Once I pulled into Wichita Falls I decided to turn south on 281 rather than drive all the way into Fort Worth and running the I-35 gauntlet again. It is a much prettier drive and I figured traffic would be light on a Monday night. I was right about that and we made excellent time until just south of Mineral Wells. It was there that we found ourselves behind what had to be the worst drunk driver I’ve ever seen. This guy was truly a menace and literally all over the road. He weaved from one side of the road to the other. He often crossed all the way across the shoulder to the point that his wheels were off the pavement. He would then over correct and veer all the way off the shoulder on the other side. He was only going about 45 mph but he was so reckless that I was afraid to pass him. It is an absolute miracle that he didn’t cause a head on collision with oncoming traffic. Fortunately, as I mentioned before, traffic was light and only a few cars were met coming northbound. We muddled along for an hour before he finally turned off the highway. Thanks to this idiot we were now about 3 hours behind schedule. Fortunately, there were no more incidents and my daughter and I arrived home safely. It is funny. I travel to some pretty rugged and isolated areas due to my unusual interests but often the most dangerous parts of these trips are on the road travelling to and from these locations. I guess this trip was no exception. I’ll be getting back to posting regularly here pretty quick now that things have more or less fallen back into their normal routine. I’ll be checking my game cameras within the week and have another possible project on the horizon. I’ll be filing you all in on the details soon. I wanted to post a note and let all of you know that I will be out of pocket for a while. There has been a death in the family and I and my clan will be on the road for most of the next week in order to travel to the funeral. As a result of all of this I'm a bit behind in my correspondence. If you have emailed me over the last 3-4 days and I have not answered it is due to the rather tumultuous week that has just passed. Additionally, I discovered this week that the voice mail feature on my phone was not functioning properly. As a result, I discovered I had dozens of messages that I had never heard much less answered. I will make every attempt to get caught up on my email and phone messages once I get back home. I would just ask for a little more patience than usual due to the unusual circumstances this week has brought. 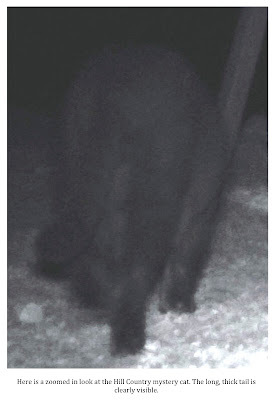 Black Panther Photographed in the Texas Hill Country? A couple of weeks ago a reader contacted me saying that he thought his game camera might have captured a photo of a black panther. This gentleman lives out in the Hill Country and had his camera overlooking a deer feeder near his home. 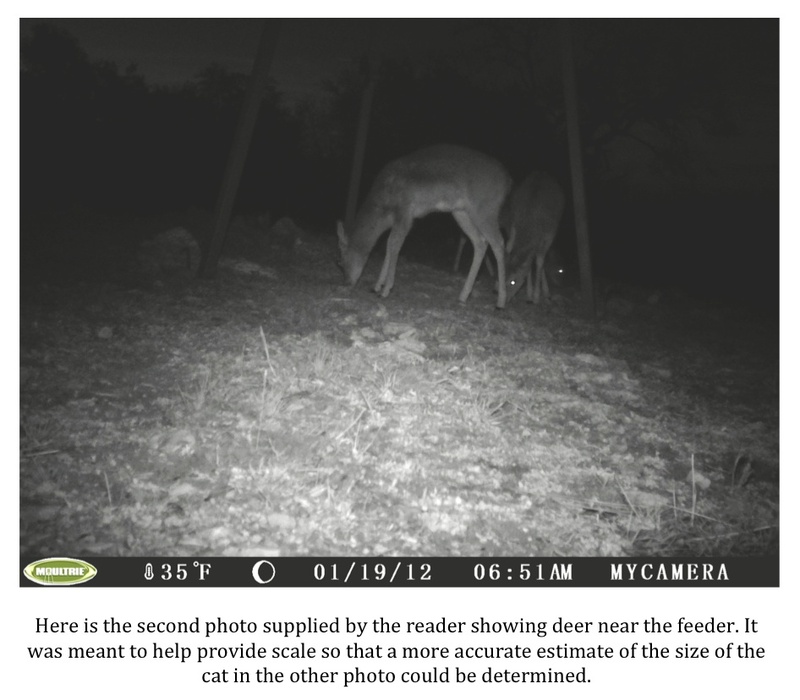 The reader attached two photos, one of the animal in question and one of some deer underneath the feeder. The deer photo was meant to provide some idea of scale. The original photos are below. The animal in the photo is unquestionably a cat of some kind. In addition, the cat is black or, at the very least, an extremely dark brown. Despite the photo being snapped at night there can be no doubt about that. This is no tawny-colored mountain lion. A long, thick tail is clearly visible. This long tail effectively squelches any arguments that this is a bobcat. So, if it isn’t a cougar and it isn’t a bobcat…what is it? As has been discussed here before, officially, black panthers do not exist. Science tells us that there is simply no such animal. It is true that other big cats occasionally exhibit melanism but they do not make their homes in North America. Leopards live in Africa and jaguars live in South and Central America. 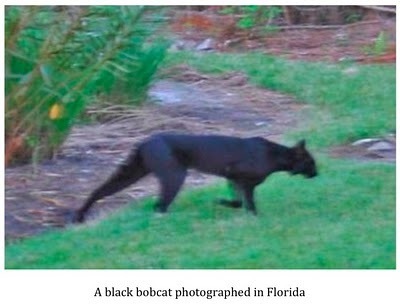 Black bobcats have occasionally been observed in North America and could account for some black panther sightings; however, once a witness describes a long tail, often almost as long as the cat’s body, the bobcat ceases to be a legitimate candidate. So, what are people seeing? What animal does this photo show? "So, what are people seeing? There are several possibilities, in my opinion. The first possibility is simply that cougars can sometimes be black. This is a well-documented trait in jaguars and leopards. Scientists have yet to see it in cougars but that doesn't mean it doesn't occur. The second possibility is that jaguars still roam the state. Texas was once part of the jaguar's natural range. The last known jaguar in Texas was killed in Brownwood in the 1940s. It is thought they may still haunt the state's southern border but are not thought by wildlife experts to range into central or east Texas. 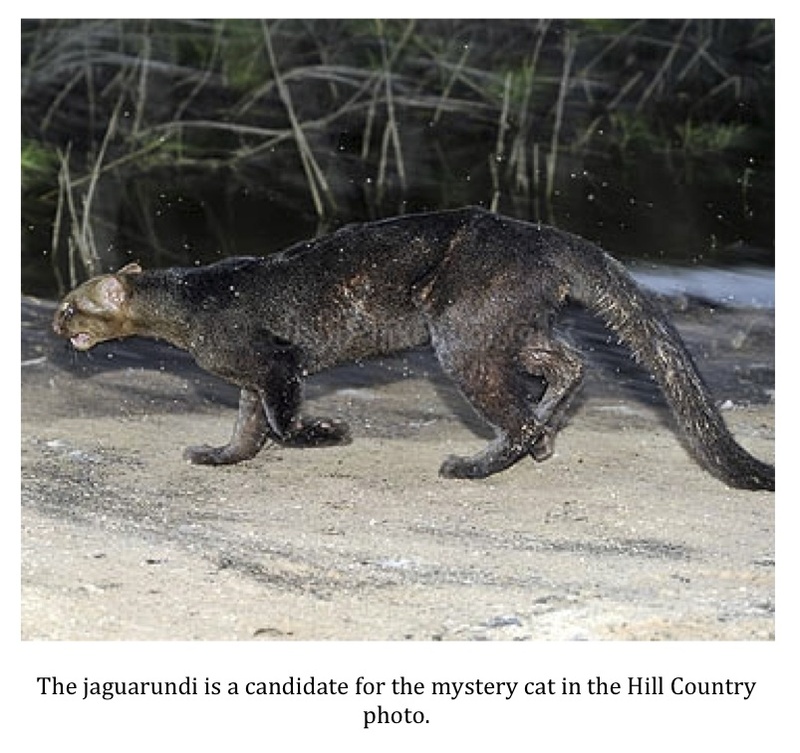 One more possible candidate for the black panther sightings is the jaguarundi. The jaguarundi is a relative of the cougar but much smaller. It averages between 30 and 45 inches long and can be dark in color though, it is thought, not black. 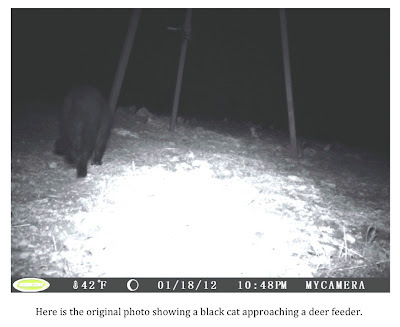 A final possibility is that there is simply an undocumented species of large black cat roaming not only Texas but other areas of the country as well." Thanks so much for sending the photo. 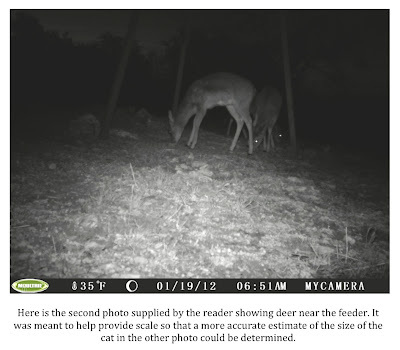 It is hard to get perfect scale on the cat because the position of camera in the cat shot is different than the deer shot. 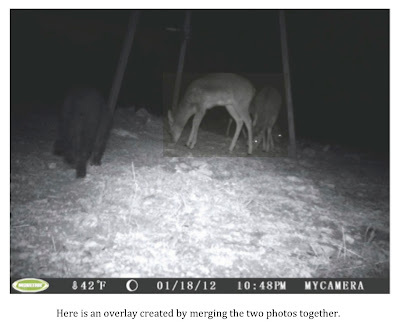 The deer closes to the camera looks like a yearling doe (first year) so it is not that big of a deer. The animal in the photo is definitely a cat and it looks the closest to a jaguarundi of any known species. It is definitely not a jaguar (no spot pattern found on the coat. Messed with it in photo shop and you could pull some spots by messing with contrast and lighting and none show) or a cougar. The body position and short legs point to jaguarundi along with the dark color. The cat looks a little fat to me which is what threw me off. Cougar and jags are both muscular but this cat is not. Jaguarundis are not a muscular cat and after reviewing a photo of a pregnant jaguarundi it looks like that might be the case. There are definitely jaguarundis in the Hill Country despite what officials say and this is the time of year many of our predators are pregnant." I agree that the jaguarundi is a good candidate for the cat in the photo. Moore’s points are well taken. There is only one point on which I disagree with Moore and that is his opinion that the camera was not in the same location for the two provided photos. 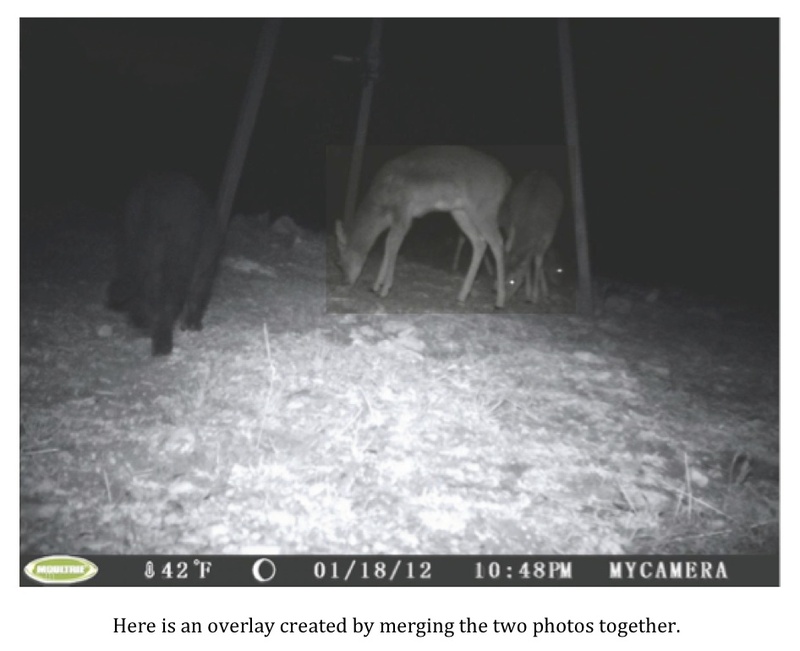 I think the overlay below shows that the camera was in the same location for both photos. Even if I’m wrong on this, the location is not significantly different and doesn’t drastically change much of anything, in my opinion. If this is a jaguarundi it is a pretty good find. According to the Mammals of Texas – Online Edition, “Jaguarundis live in the brush country of extreme south Texas in Cameron, Hidalgo, Starr, and Willacy counties – where it is rare.” They aren’t supposed to be in the Hill Country of Texas. Then again, they aren’t supposed to be in east Texas either and Moore himself says that he has seen one near Lake Sam Rayburn. Moore is right in that the photo simply doesn’t show enough detail to be able to say definitively what this cat might be. In addition, after studying the photo and looking at about a dozen different models of feeders at a Gander Mountain store this past weekend in an effort to better judge the size of the cat, I’ve come to the conclusion that the cat in the photo is likely not large enough to be a cougar or jaguar. I realize it could be a juvenile but the dearth of any black cougar specimens and the lack of florets, or spots, on the cat in the photo (florets are almost always still visible even on melanistic jaguars), in my opinion, lends credence to my opinion. 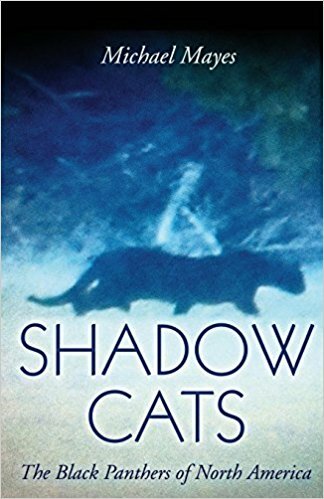 That leaves two possibilities: a jaguarundi or a domestic/feral cat. I don’t really believe that this cat is a domestic. I think it is too big for that. 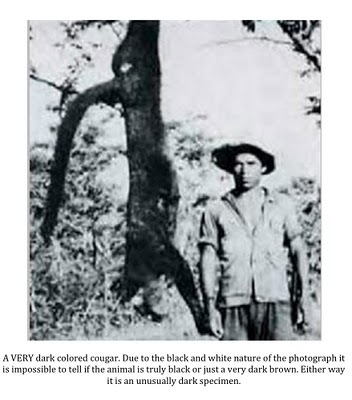 I think the animal in the photo is most likely a jaguarundi (Puma yagouaroundi). If so, it is an exciting development. If the cat is pregnant, as Chester Moore suggested, then that is even more exciting. Not only would there be a jaguarundi where it is not supposed to be but there would be a breeding population of jaguarundis in a region where they are not officially recognized. Please keep sending in your accounts of black panther sightings and any photos you might capture. Pieces of anecdotal evidence like this could help people like me know where to investigate and best place their cameras. This, in turn, could lead to the clear video footage or photograph that could prove these large cats do exist and roam the Lone Star State. Again, let’s work together and get this done. "...discrediting the study of creatures whose existence is unproven countermands the scientific commitment to explore the unknown." I can't think of much more to add to this. Pretty much sums it up. 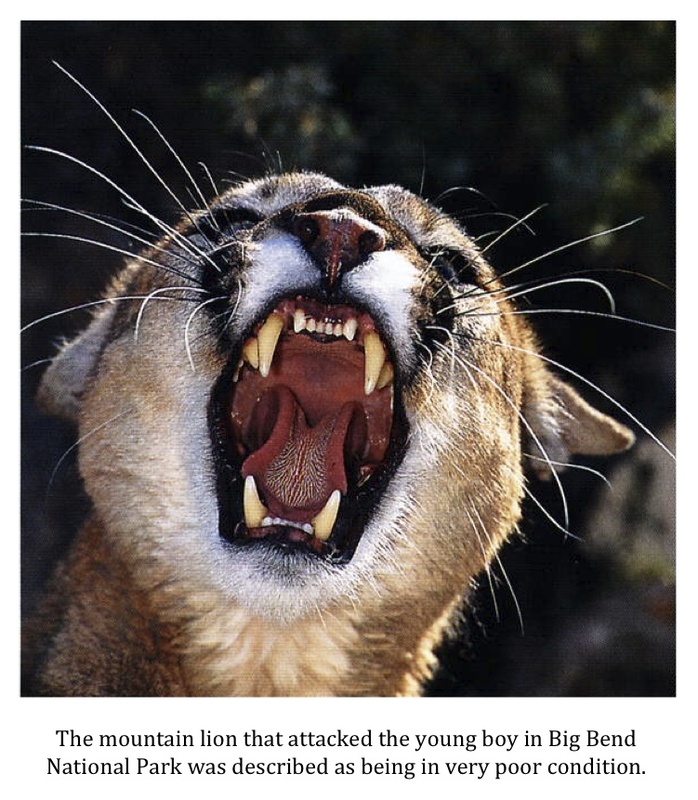 National Park Service personnel are on the hunt for a mountain lion (Puma concolor) that attacked and injured a 6-year old boy earlier this week. The boy was walking with three other people when he was singled out for the attack. Big Bend National Park official David Elkowitz said the boy was treated at a hospital in Alpine for puncture wounds and scratches. The boy’s injuries were not serious and he was released from the hospital shortly after seeking treatment. Officials evacuated campsites early Monday and closed other trails and areas of the park including the Chisos Basin, Window Trail, the Pinnacles, Boulder Meadow, and Juniper Flats so that the hunt for this cougar could get underway. If the animal that attacked this young boy is located it will be killed. Officials really have no choice in that matter. As of now, however, the lion remains on the loose. This attack should not discourage people from enjoying the outdoors; however, it should serve as a reminder to remain vigilant at all times. Wild animals are just that…wild. They can be dangerous and when faced with extreme conditions like the drought Texas is currently suffering or if sick or injured they will behave in atypical ways. I would not say that outdoors enthusiasts should beware; rather I would caution them to be aware. 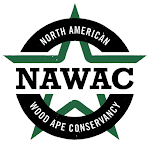 Nothing can prevent every animal attack, and this situation may very well fall into that category, but if you are going to be spending time in the outdoors, especially in an area with which you are unfamiliar, do a little homework. Find out what wildlife might be present in the area and then combine awareness with a bit of common sense. Doing so might save your life. I thought I would give you all a bit of insight into the sort of sheer idiocy I see on a weekly basis. You may remember that a while back I was actually contemplating “retiring” from writing this blog. There were several reasons for this but one of the main factors was the large amount of ignorant and hateful correspondence I receive on a weekly basis. Most days I let this sort of stuff just roll off my back but it does wear on me after a while. I try pretty hard to write intelligently on a variety of topics. I don’t pretend to be an expert on anything. I’m just a guy who has an interest in the natural world, in general, and wildlife in particular. 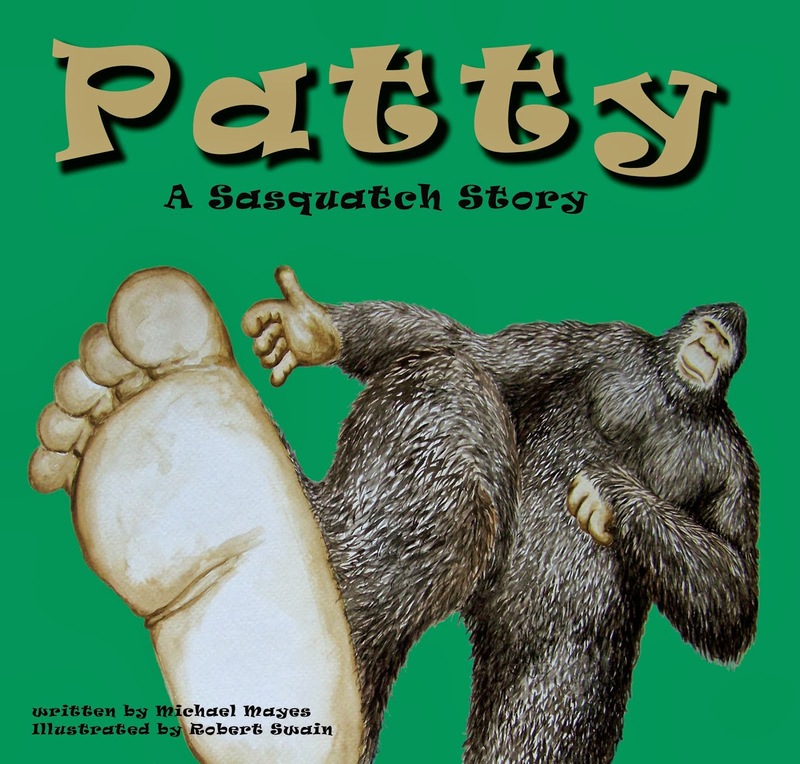 While I do have an interest in cryptozoology, particularly the bigfoot mystery, most of the time I write about much more common animals and topics. Why this inspires such negative reactions in some people I will never understand. While I hesitate to publish correspondence from cretins, I thought I would give you all an example of the sort of thing that makes its way to my inbox. Below is an email I received this week from an anonymous reader (the jerks always remain anonymous, it seems) in response to a post I did called “Wolf Attacks on Humans on the Increase” back in March of 2010. I would ask you go back and read the post and then read the comments below. Did this guy even read the post? The comments do not make any sense. The two people referenced in the post that were attacked by wolves were from Alaska and Canada. That being the case, where does the redneck reference come from? Wishing a person dead is a disgusting sentiment and provides a bit of insight into this person’s sick mind. This moron ends his comments with an accusation that I have made this entire story up just to justify the hunting of wolves and/or other animals. His final shot at Texans in general is an all too familiar refrain from his ilk. The overwhelming majority of correspondence I receive is positive in nature. I don’t mean that everyone agrees with me on everything, rather, I mean that the messages are intelligently written by someone who has actually given the topic in question some thought and who has chosen to voice their opinion in a civil manner. A few times a week, however, I get a something like what you just read. Generally, I just delete the offending posts. I’ve stated before that I will publish all comments, whether they agree with me or not, as long as the writer abstains from name calling, insults, and sheer insanity. This post would normally be zapped due to its hateful nature but I decided to print this one just to show all of you the kind of stuff I see on a weekly basis. So, let’s go over the rules one more time. Feel free to comment on any and all the posts you want. Send me an email if you feel you need more room than the “comments” feature allows. Understand that no comments or emails containing hateful, profane, or downright crazy language will be published. If you can’t be civil, you won’t be heard. Not here anyway. Again, I’m not saying that only comments that agree with my ideas will be published. Nothing could be further from the truth. I AM saying that if your vocabulary is not expansive enough to articulate your thoughts without insults, profanity, or making you appear to be a lunatic you are just wasting your time. To the vast majority of you out there who are not drooling imbeciles, I say thank you. Your comments and thoughts are ALWAYS welcome. They restore my faith in the human race. Keep your correspondence coming. If I don’t publish your comment right away or reply to your email quickly it is likely because I’m wading through garbage like the example above. Be patient and I’ll get back to you. If, however, you are a mouth-breathing simpleton that types in all caps, fails to use spell check, and won’t even sign your own name (probably because you can’t spell it), well…do us all a favor and keep your comments to yourself. 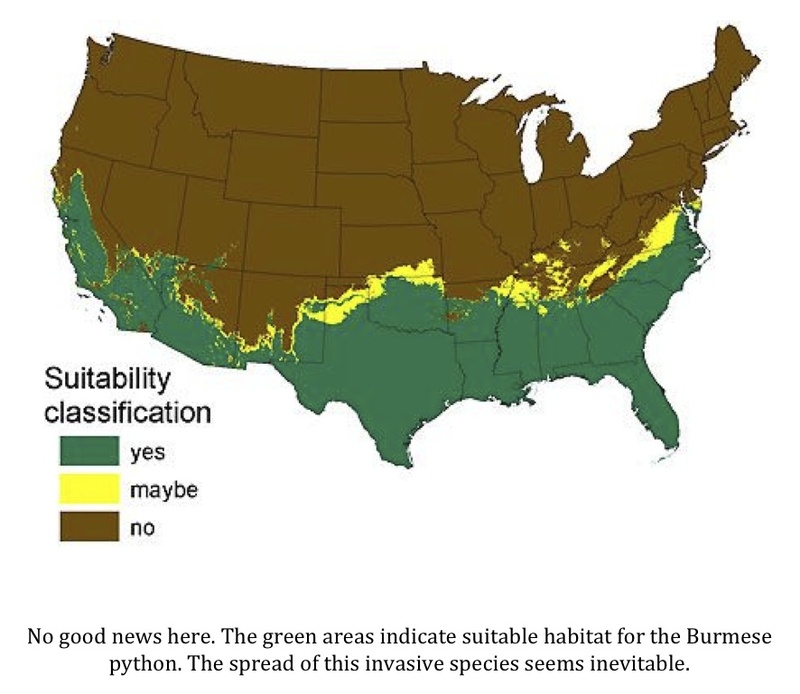 Invasive Burmese pythons have been in the news in a big way this week. I’ve seen stories on at least four different sites and/or newspapers. 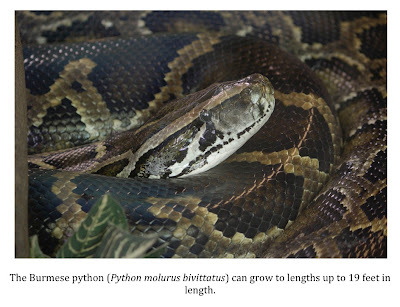 The stories mainly center on pythons in the Everglades of Florida. 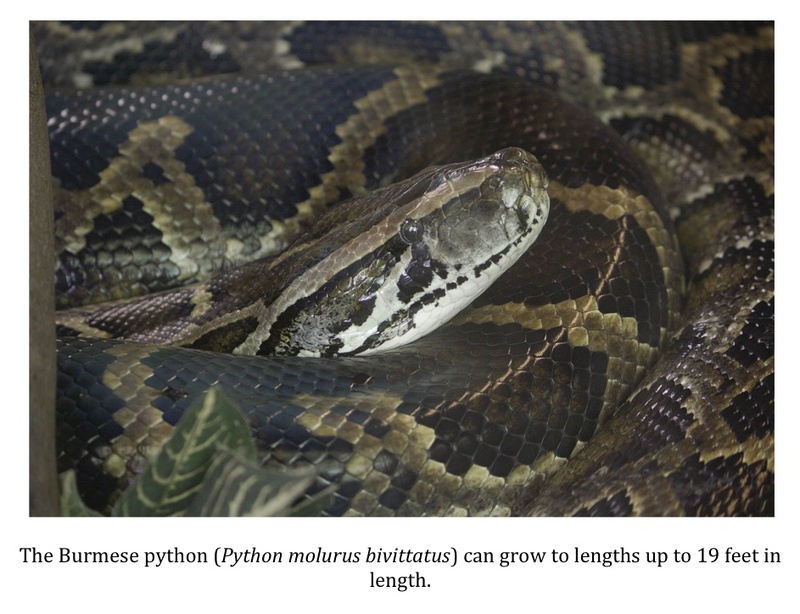 It seems surveys show that the numbers of many small mammals like raccoons, rabbits, and opossums have dropped precipitously in the last few years in areas pythons are known to inhabit. The articles also mention that larger animals like deer, bobcats, and alligators could also be at risk. Other news outlets have run the story as well but the links above will get you to articles that are pretty representative of what is being said about the python problem. I feel it is just a matter of time before we start to see these giant constrictors in other parts of the south. I hope I’m wrong…. …but I don’t think I am.